When I started college, I was pretty homesick. I had never really been far away from home, and Indiana University was nearly four hours away from my familiar stopping grounds. My birthday is in September, just a few short weeks after my freshman year had started, and I was in desperate need of something from home. And my sister being the most wonderful sister in the world, she must have known that, because a homemade recipe book made its way to my new address. 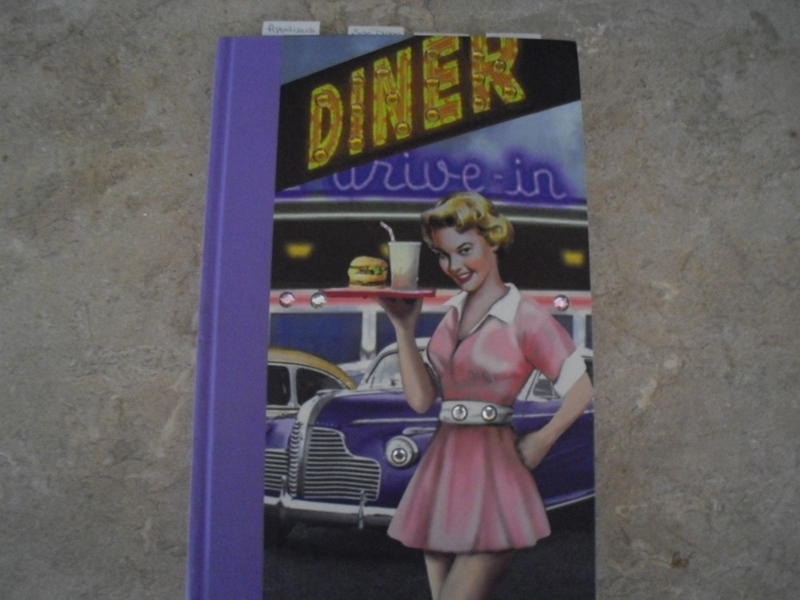 Inside, my sister had documented all of our family recipes inside. With a handwritten inscription, my sister brought me to tears with her words. And I have held on to that recipe book with dear life every since. It has accompanied me to my first apartment after college, to my apartment with my cousin Ashley, to my first place with PoppaNut, and now to our beautiful home. I’ve added my favorite recipes over the years, and I consult is each and every time I’m in the mood to make something new. My favorite entries are the ones in my grandmother’s own handwriting. Her famous Texas sheet cake, which my cousins hid each Thanksgiving in Indiana in order to save the most for themselves, is documented inside, along with her peanut-butter balls, her scotcharoos and more. The only one missing is her famous strawberry jam, which I hope to learn to make someday as well. So, with my recipe book in hand, I flipped through the familiar, recipe-stained pages for just the right thing to make. Scotcharoos it was! 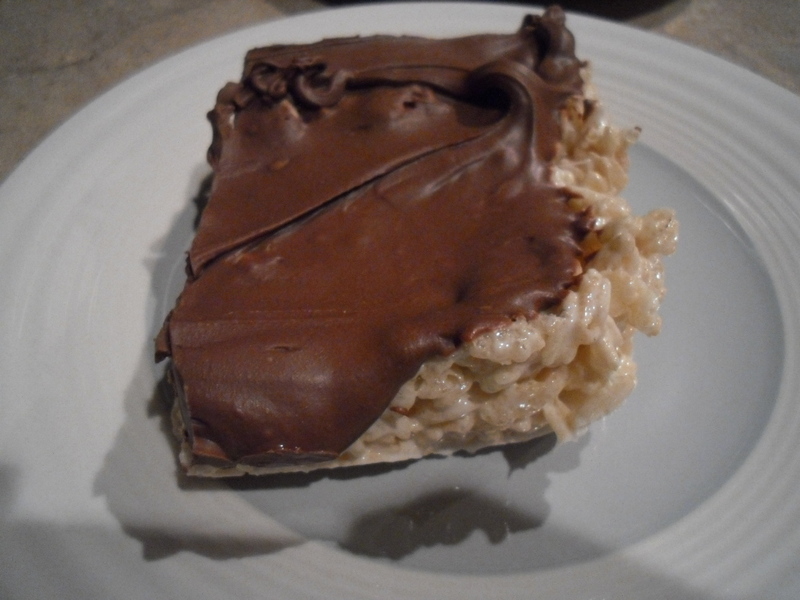 Now, if you haven’t heard of scotcharoos, it is basically Rice Krispy Treats with chocolate and butterscotch chips melted over the top. However, I made a few adjustments of my own. 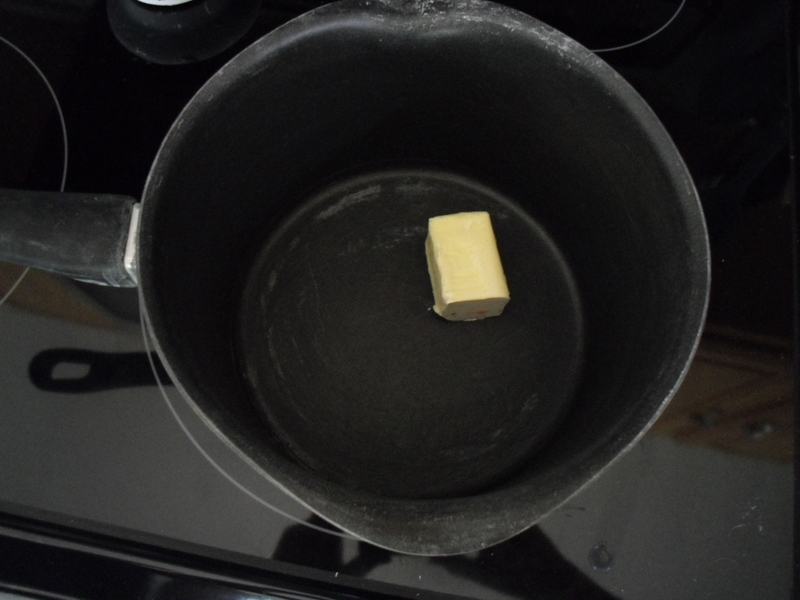 Melt butter in a medium saucepan on low heat. 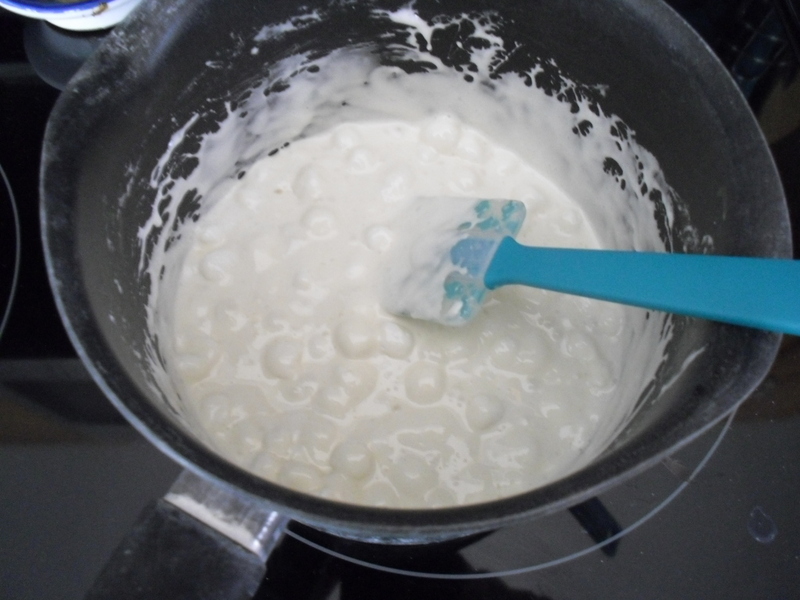 Then, add in marshmallows, and mix until well-blended. 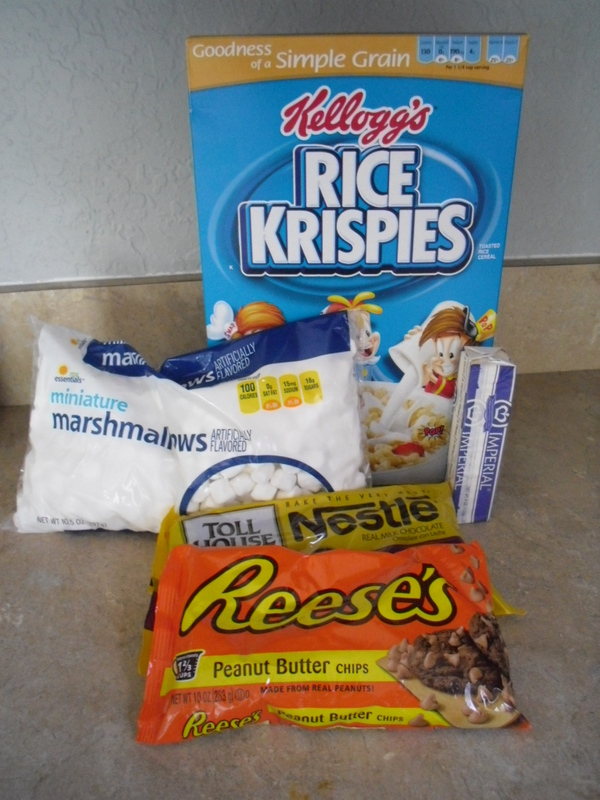 Add in cereal, and mix well. 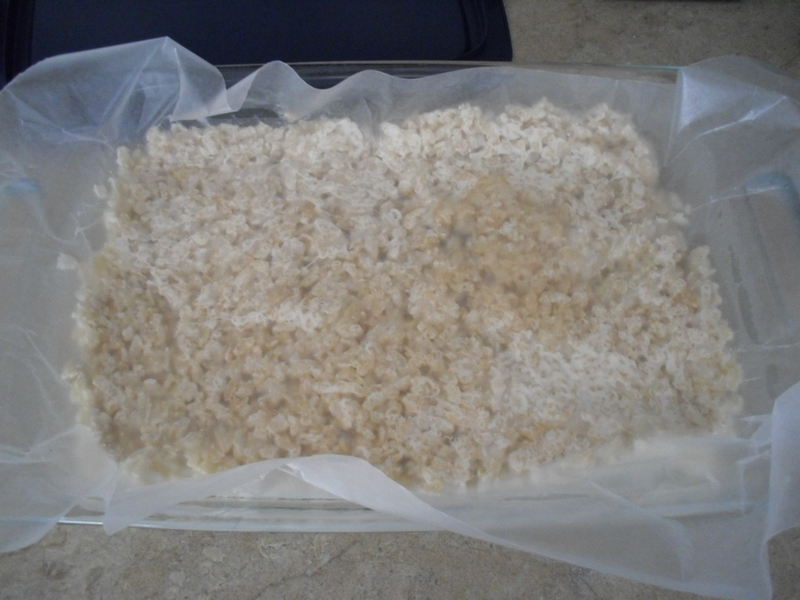 Pour into a rectangle pan, and place wax paper over the top. Then, press down and carefully remove wax paper. In a microwave-safe bowl, add in chips (I actually used chocolate chips and peanut-butter chips). 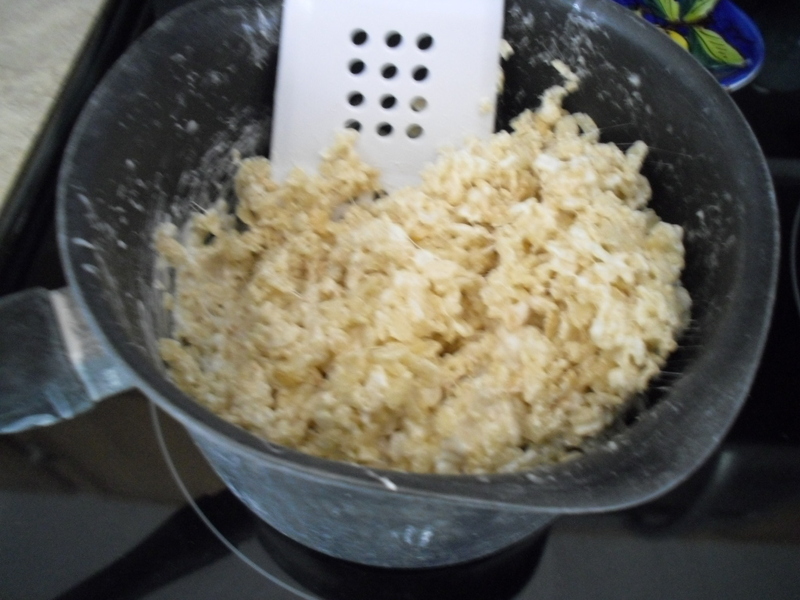 Place in microwave on high on 30-minute intervals, stirring each time, until all chips and melted and blended together. Pour over the top and place in fridge to set. Serve with a tall glass of milk! I sure hope you enjoy them. 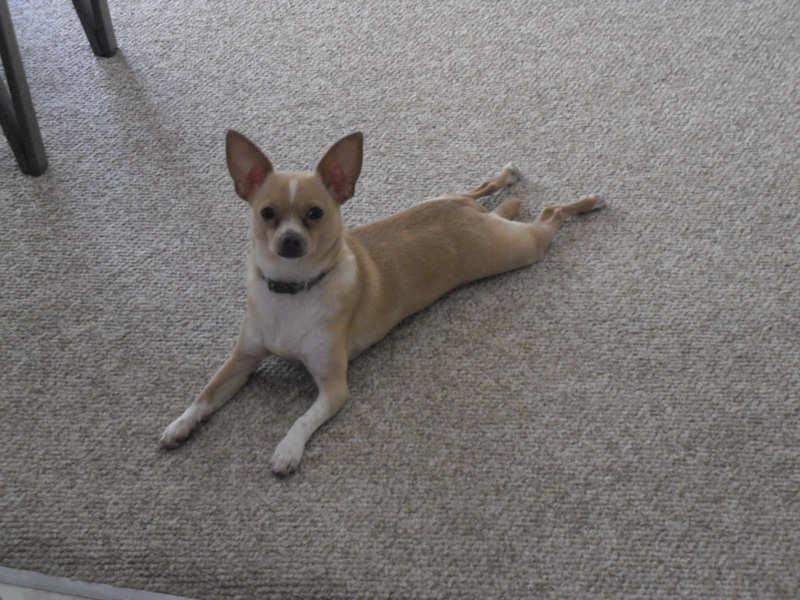 My little Cashew literally stretched out and watched me make them. I think he was hoping I might drop some so he could sample it too! And that’s life in a nutshell … making scotcharoos not only satisfies my sweet tooth but it warms my heart thanks to the family tie. We have Grandpa’s homemade fudge recipe too. It will be a great addition to that book of yours! Awww….sis, I totally forgot about that recipe book I got you! 🙂 How sweet am I? LOL I love Scotcharoo’s, but you know we always keep them in the fridge because we like them best cold. 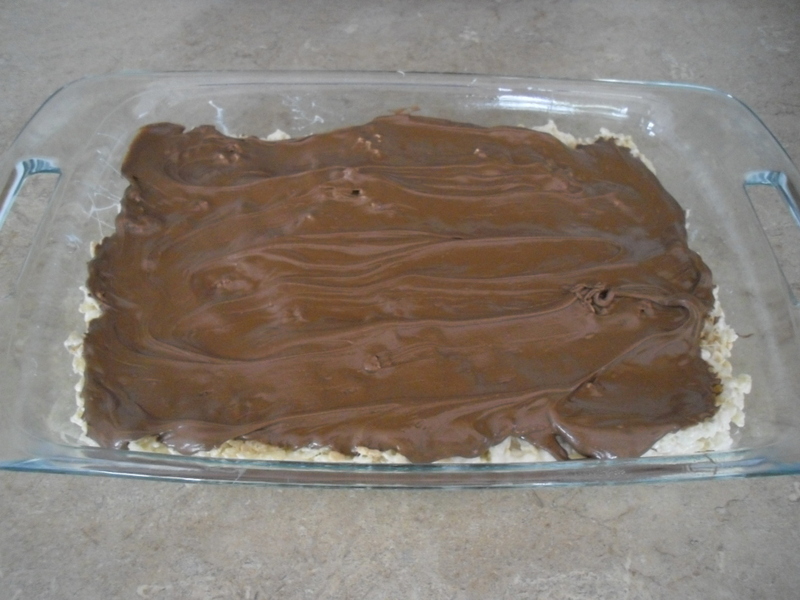 I also have a yummy chocolate chip cheesecake recipe I bet everyone would love. That’s the number one request of all my kiddos for every holiday!